It’s week one of Jim Groom’s MOOC Digital Storytelling also known as #ds106 and I find myself reflecting on the difference between being creative and being innovative and how that difference is what intimidates me about this course. 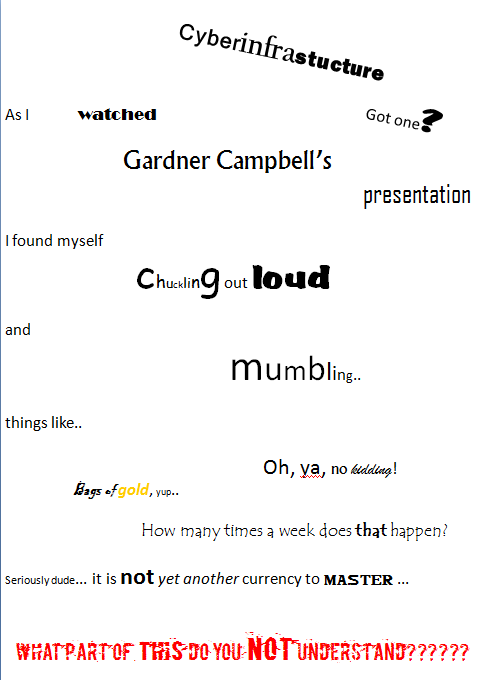 Above is a wordle of one part of the first assignment which was to read Gardner Campbell’s article “A Personal Cyberinfrastructure.” I read it and then I wordled it. I wordled it because that is what I do. I don’t create, I innovate. Ok, ok, this is not spectacularly innovative. It’s a wordle, I know, get over it ☺ It is however, what I do, a lot. I take two or more spectacular things or ideas and mash them together into something different. The sum of the parts does not always equal or enhance the whole, but sometimes, I get lucky, and it does. In this case it is not spectacularly better than the parts but it is kind of cool. I lucked out and hit random enough times to come up with a tree like shape.. or an axe (adding this to my ink-blot collection) either way the shape adds emphasis and tells a story that I believe is in alignment with the authors intentions. I have to add that it is my frustration taking the lead on this. I get it. Ok, I get parts of it. It is like we just invented the alphabet. What is going on right now and what will be going on technologically and societally is immense. The challenge is that we are not all at the same place in realizing what is going on. Even those who are getting a sense of it are in the middle of the forest, we can’t possible see the the entire scope nor can anyone accurately imagine what the possibilities are. But we can guess. We can try to anticipate and encourage participation in the process of discovering what is next. To do this we really need to help today’s learners build the capacity and acquire the literacies that they will need in order to participate responsibly and fully. K, rant over.. caught it early this time.. whew! Next Next post: Are you a ______ phile?